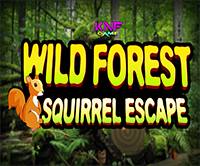 KnfGame - Knf Wild Forest Squirrel Escape is another point and click room escape game developed by Knf Game. Assume that when you are travelling in a wild forest on the way you found a squirrel got stuck inside a snag (dead tree) and it seems it is stuck inside for more than 2 days. So try to escape the squirrel by solving the puzzles with the help of objects around the forest. Good luck and have fun! Roberto--Can you give me the long numbers the one with colors? I forgot to mark down 1 number and I don't remember where the clue was. Can't find clue for 6 digit # or an axe head. reporting this game. 2 things. I was stuck & tried to go to KNF walkthrough. Anti virus blocked as infected. Got past that but before could finish last scene w/ axe, a pop up appeared wanted to know if I were 18 before going to a game. Pictured very scanty clothed women. Don't know just thought should report.